Since 1866, the “Magnificent Edifice” at First and Main Streets has provided entertainment in Dayton in many names and forms, but one thing has remained constant – a tradition of celebrating and enriching life through the performing arts. 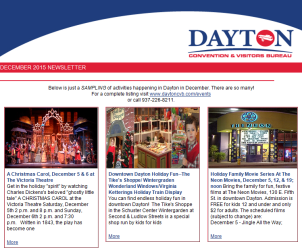 The Victoria Theatre provides a variety of compelling Dayton entertainment options and is home to performances by many of Dayton’s arts organizations, including Dayton Ballet and Muse Machine. In addition, Victoria Theatre Association presents Projects Unlimited Star Attractions, the Morris Furniture Co. Family Series, the Universal 1 Credit Union VIC150 Music Series, the National Geographic Live Series sponsored by Subaru of America and Wagner Subaru, the University of Dayton Center for Leadership Speaker Series sponsored by Premier Health, the Cool Films Series, and the Discovery Series at the Victoria Theatre. The Victoria Theatre is also available to rent for meetings, parties, receptions, and performances.